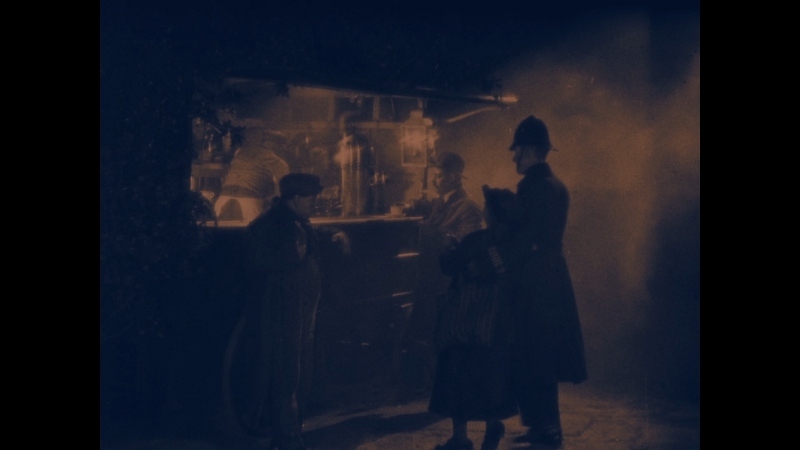 As the first of several filmed adaptations of Marie Belloc Lowndes' popular 1913 Jack the Ripper novel---which has had no shortage of highs and lows during the last century---The Lodger: A Story of the London Fog (1927) stands tall as what Alfred Hitchcock considers his motion picture debut. It's actually his third, but this 90-minute silent film contains so many firsts in Hitch's future arsenal of trademarks (bait-and-switch suspense, clever visual effects, and even a cameo) that it's easy to nod in agreement. Regardless, its setup is more or less the same as Lowndes' novel and most adaptations: fear has infected the foggy streets of 19th century London as a mysterious killer---here known as "The Avenger", with his own calling card---routinely murders a young blonde woman every week. Just after the most recent murder, an unnamed young man (Ivor Novello) seeks lodging at a nearby boarding house owned by Mr. and Mrs. Bunting (Arthur Chesney and Marie Ault), whose beautiful blonde daughter Daisy (June Tripp) works as a fashion model. Meanwhile, Daisy's romance with police officer Joe Chandler (Malcolm Keen) gives them an obvious advantage in predicting the killer's next move. Yet even though the new lodger appears to match the police description and his behavior is...questionable (to put it mildly), he seems to be as safe as Superman with a pair of black-rimmed glasses. Yet in true Hitchcock fashion, the tension mounts: a pattern emerges from what was once thought to be a series of random locations, and it isn't long before they close in on the killer. Hitchcock's adaptation, featuring a screenplay by Eliot Stannard, is able to milk a bit more from the source material---especially in comparison to other adaptations, including the 1944 film which plays it much straighter in direct comparison---by completely subverting our expectations about the killer's true identity. Things take a drastic left turn during the film's final stretch and, depending on your ability to piece together a few subtle clues along the way, might even feel like an emotional cop-out (which it kind of is, but not as blatant as the one in Suspicion). Regardless of this twist's effectiveness, such a daring bait-and-switch certainly livens up The Lodger at the right time; otherwise, we might have been perfectly fine with letting the fairly predictable plot coast by on its remaining power. Imagine that: a suspense film that doesn't necessarily live or die based on the success of a twist ending. Whether the final shot can be read as a possible second twist is up for debate, but likewise adds even more intrigue to what might otherwise be an open-and-shut case. Even without music cues suggesting that this isn't "happily ever after" for Daisy, the clever framing and background details of this last scene feel like the young lovers' story will take yet another sharp turn in the future. Or maybe we're just reading too much into it. Either way, the result is nonetheless a landmark in Hitchcock's early career, and one in which the director tightened his formidable command of film as a truly visual medium. 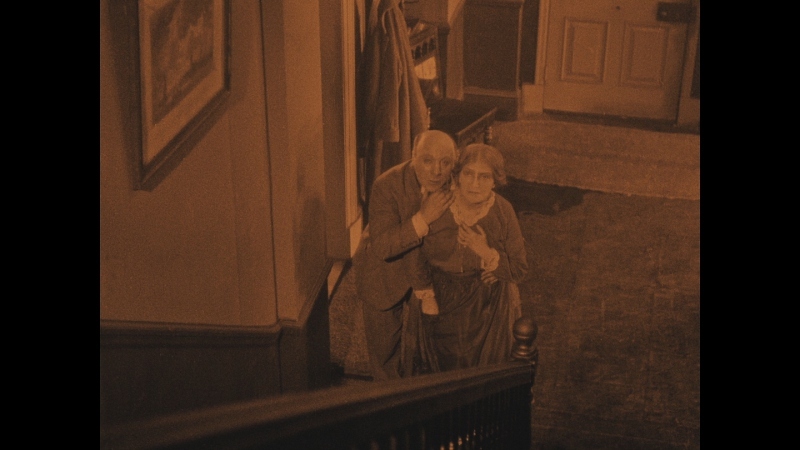 Even without the added bonus of sound, The Lodger speaks volumes. First released DVD on at least one public domain disc back in 2001, The Lodger earned a decent upgrade as part of MGM's Alfred Hitchcock Premiere Collection seven years later. This upward trend continues with Criterion's outstanding new Blu-ray package: sourced from a 2K restoration by BFI and paired with a new orchestral score by Neil Brand (performed by the Orchestra of Saint Paul's in London), we also get a handful of informative old and new supplements that help secure The Lodger's place in Hitchcock's durable filmography. We also get a bonus Hitch silent film: Downhill, released only months after The Lodger, which also shares some of its cast and crew members (star Ivor Novello, screenwriter Eliot Stannard, and editor Ivor Montagu) and features another new score by Brand. Presented in its original 1.33:1 aspect ratio, The Lodger looks much more refined than Whirlwind's 2001 DVD, as well as the version found on MGM's Premiere Collection seven years later. This 1080p transfer is the result of a new 2K restoration and, combined with the benefits of better encoding and format resolution, everything about these visuals is more impressive overall. Black levels are fairly consistent, image detail and textures look quite good, and a light but noticeable grain structure is represented well from start to finish; the result is an extremely film-like appearance that nonetheless still shows its age in some respects, such as occasional missing frames, flickering, softness, etc.). The color tints look quite good too, preserving the film's deliberate palette perfectly. No obvious digital imperfections or manipulation could be spotted along the way, either. I can't imagine The Lodger looking much better on home video than it does here, so die-hard fans of the film should be pleased with Criterion's efforts. There's much less to say about the PCM 2.0 track, a newly-commissioned score by Neil Brand and performed by the Orchestra of Saint Paul's in London. Clarity is, not surprisingly, very good, with plenty of eerie and romantic overtones blending very well to create a suitable atmosphere that plays to The Lodger's strengths, along with plenty of channel separation to give it a moderately wide presence overall. No subtitles for this one, obviously. As usual, Criterion's interface is smooth and easy to navigate. This one-disc release is locked for Region A players; it's packaged in their typical "stocky" keepcase with stylish artwork based on vintage poster designs. The included Insert features notes about the new restoration and essays on The Lodger and Downhill by critic Philip Kemp. As expected, plenty of quality stuff here. The biggest extra is Downhill, a separate 1927 silent film directed by Alfred Hitchcock (his third that year!) and also starring Ivor Novello; like The Lodger, it's also been granted a 2K digital restoration and new piano score by Brand. 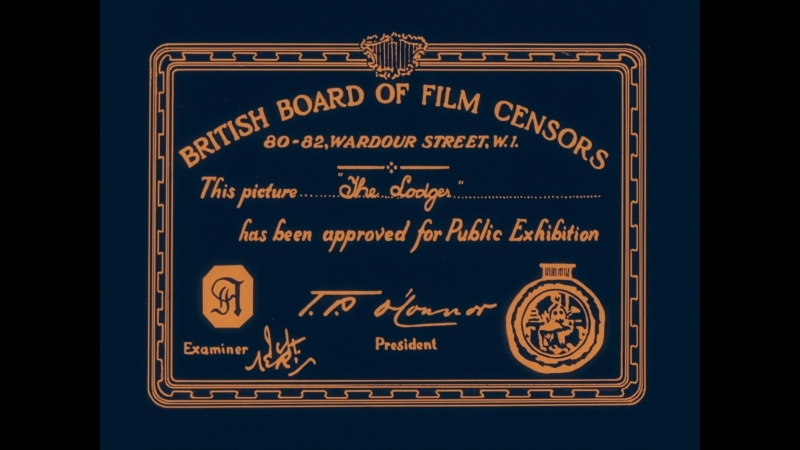 Though much different thematically, it employs a similar visual style to The Lodger and later Hitchcock films, allowing clever and accessible visuals to outnumber wordy inter-title cards. Moving on to the film-specific supplements, next up are two enlightening new Video Interviews with film scholar William Rothman (32:55) and composer Neil Brand (22:37); the first compares visual themes in The Lodger to Hitchcock's later efforts like Suspicion, Marnie, Vertigo, and more. It's a very candid and revealing chat that, with a bit of polish, could've easily been padded to a feature-length audio commentary. Not surprisingly, Brand speaks at length about the process of composing for The Lodger and other silent films, a tricky process of interpreting moods without distracting from the visuals. Also of similar interest is a new Video Essay by art historian Steven Jacobs (17:42), who likewise uses a clip-heavy format to discuss the importance of space and architecture in Hitch's films. Rewinding a bit, we also get a few vintage features from decades' past. Three Audio Interview Excerpts with Hitchcock are up first: one from 1962 with filmmaker François Truffaut (26:22), and two with filmmaker Peter Bogdanovich from 1963 (19:42) and 1972 (20:58). We also get a mid-length Radio Adaptation of The Lodger first broadcast in 1940 and directed by Hitchcock (30:48), which doubled as an audition episode for CBS Radio's long-running Suspense. 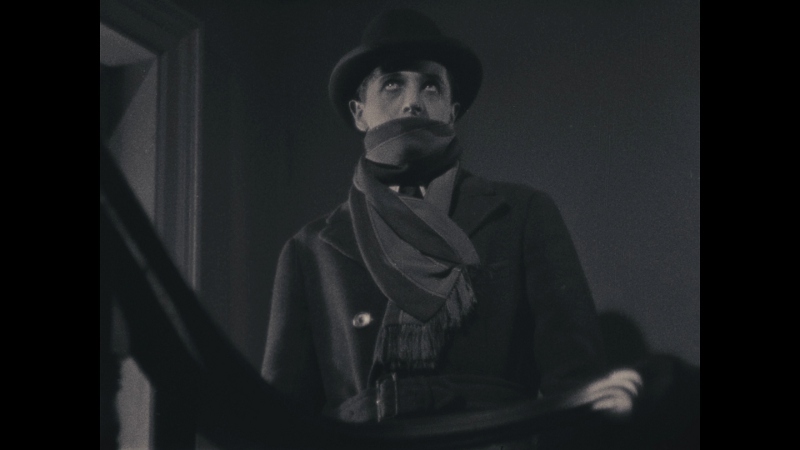 The first filmed adaptation of its source material, Alfred Hitchcock's early career highlight The Lodger: A Story of the London Fog represents a lot of firsts for the fledgling director. Filled with clever visual flourishes, wonderfully unique design elements, and a handful of memorable performances, it's the rare 90+ minute silent film that still has the capacity to thrill modern audiences from start to finish. Criterion's new Blu-ray offers plenty of support, pairing a 2K restoration with a new score by Neil Brand---and if that weren't enough, they pile on several film-specific supplements and make it a double feature with the newly-restored Hitchcock silent film Downhill, released the same year. Not surprisingly, a top-tier package for established fans and newcomers alike. Highly Recommended.